Re-mastered and hard-to-find Rock classics that changed Christian music forever and impacted millions around the world. This anthology includes songs from Steve Taylor, Whiteheart, Larry Norman, Resurrection Band, Petra and many more! 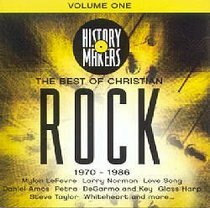 About "The Best of Christian Rock Volume One (1970-1983) (History Makers Music Series)"